Korm Plastics is proud to present the tenth release in the Brombron series. Originally a co-production between Staalplaat and Extrapool, it is now hosted by co-curator Frans de Waard. In the year 2000 Frans de Waard and Extrapool started the Brombron project. Two or more musicians become artists in residence in Extrapool, an arts initiative in Nijmegen, The Netherlands, with a fully equipped sound recording studio. These artists can work in a certain amount of time on a collaborative project; a project they always wished to do, but didn't have the time or the equipment to realize. 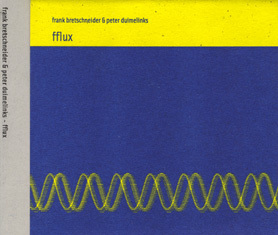 Frank Bretschneider is one of the vital producers in the global electronic network. A member of the raster-noton collective, he also has releases under the names Komet and Produkt. Bretschneider has created some spacial electronics of the late 90's and 00's, unlike so much output in the microscopic music scene, his music has always flourished with activity. Precise sound placement, volume levels and the contrast of tones in Bretschneider's production makes his compositions captivating. Bretschneider goes beyond the plug-in or plug research electronics. He redefins the genre by rendering the parameters playable, reentering the musical domain with unprecedented ease. Bretschneider discovers the complexity of the virtual: microtonality, clicks, complex rhythm textures, melodic fragments. Peter Duimelinks' music activities date back to the mid eighties, in a time in which he co-founded the musique concrete group THU20 with a.o. Roel Meelkop and Jos Smolders. Working with THU20 was of vital importance to Duimelinks and it shaped his ideas and concepts about sound and how to work with it. Traces of this period can still be heard in his more contemporary solowork, which usually consists of field-recordings sometimes heavily reworked but mostly used in it's pure form, and then organised into a composition. He is also a member of the improvisation trio Kapotte Muziek and electronic pulse trio Goem. In the last 15 years he has also collaborated extensively with visual artists, film and video makers and contemporary dance choreographers, and has had several exhibitions of sound installations. He runs the V2_Archief music/sound label and the audio.nl label.